2013: What does peace look like to you? 2012 will go down as a year of extreme highs and lows. If your 2012 was mellow and consistent, take a moment to congratulate yourself for having enough shock absorbers in place to ride the quakes! You must have put in some work to create and sustain stability in such turbulent times. Good on you, and may that calm follow you and your family into the next year. On the other side of that coin, the amount of upheaval in 2012, to me, felt unprecedented. If I were to try to list all of the major crisis hitting so many communities- in just the US alone- this would be the never ending entry. Super storms, economic exploitation, sexual assault, murder, immigration, restricted reproductive rights, incarceration, HIV transmission rates… throughout the year personal narratives of struggle flitted through my twitter stream. Blog posts by first time writers sharing the intimate details of their personal iMix of injustices were shared over and over again. Reassuring comments to devastating status updates were a daily reminder that folks use Facebook as a means of support in the both the best and worst of times. Stories told at my own kitchen table of violence and debt, desperation and depression, missing loved ones and so much second guessing on how to raise our kids within impossible situations. I know that this is the part of the blog post where I’m supposed to bust out the bright side. Graphically detail the silver lining as best I can so that you feel uplifted. A few bold affirmations to get you though the next series of challenges. And I will. It is formulaic… but it is a formula that works. The truth is, the silver lining is you. Your voice. Your experience. Your interpretation of family, of community-making, of justice, of triumph, of identity, of sexuality, of safety matters so much in times like these. We can’t have too many voices sharing their truth in 2013- it’s not possible. There is no limit, no maximum amount to be respected. The more of us that tell our tale, the better off we will all be. What does peace look like to you? What does security feel like for your family? Who is fighting the same battles and celebrating the same successes as you? Strong Families Initiative: Join people all over the country in telling us how your family is strong and what stands in your way of keeping your family strong. Take Action with the Ella Baker Center. You can get educated on a huge variety of solutions to human rights violations. From local civil engagement to immigration policy reform, you can get involved. Join Ultra Violet, a community of women and men, fighting to expand women’s rights and combat sexism everywhere – from politics and government to media and pop culture. In Oakland, take writing workshops at InkRise, a new writing group for survivors of violence to develop the tools of narrative writing. Check out CultureStr/ke a new publishing platform for artists, writers, filmmakers, musicians, and other cultural workers who want to fight anti-immigrant hate by bringing out the stories of migrants and creating counter-narratives about migration. Read and watch true stories of LGBT people and then submit your own at I’m From Driftwood. The site collects stories of gay people from all over the world. These are just a few possibilities amongst so many, my goal is not to overwhelm, only to provide some options to connect. My hope for us all in 2013 is to feel connected and not be ashamed of our struggles. 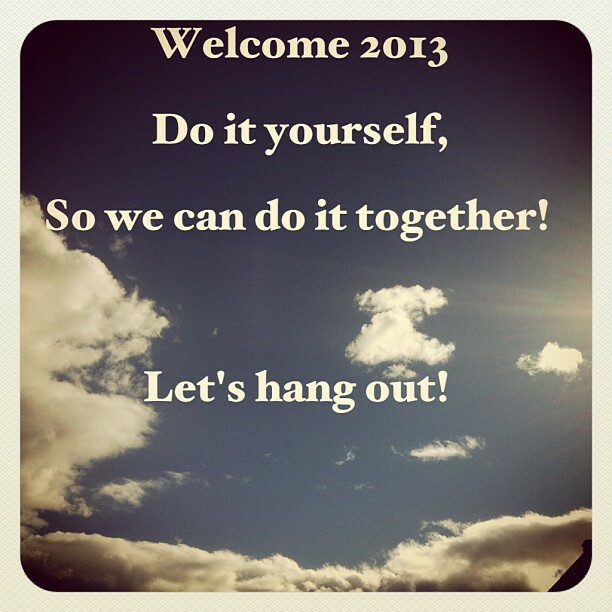 We can refuse to allow the upheaval of 2012 to isolate or invalidate us, but rather motivate us to reach out. Here’s to a beautiful new year! We are all in this together.